Chard is an accomplished Welsh actor who actually started his career while living in Australia. He attended the National Institute of Dramatic Art, did numerous tours (including The Glass Menagerie) and played Prospero in The Tempest at age 21 ("lots of gray hairspray"). He then went into television and starred in the most succesful program in Australian television history, Number 96, five nights a week for four years. Formerly an opera singer, he also recorded for RCA records, hosted his own variety show, and toured the country doing cabaret. After also starring in the Australian films Lady, Stay Dead and Brothers, he was offered a guest starring role in The Thorn Birds for Warner Brothers, and returned to the Northern Hemisphere. His career has varied from starring in action films in the Phillipines to appearing as a regular on Santa Barbara. 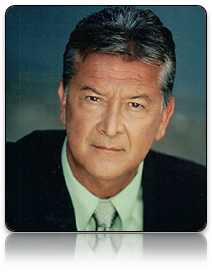 His numerous TV credits include Hunter, Bablyon 5, Days of Our Lives, and Lost.